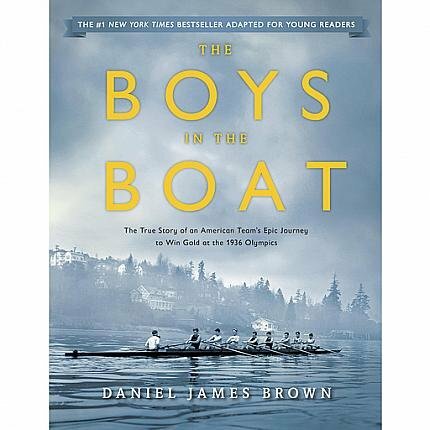 The Boys in the Boat celebrates the 1936 U.S. Men’s Olympic eight-oar rowing team—nine working class boys who stormed the rowing world, transformed the sport, and galvanized the attention of millions of Americans. The sons of loggers, shipyard workers, and farmers from the American West, the boys took on and defeated successive echelons of privilege and power. They vanquished the sons of bankers and senators rowing for elite eastern universities. They defeated the sons of British aristocrats rowing for Oxford and Cambridge. And finally, in an extraordinary race in Berlin they stunned the Aryan sons of the Nazi state as they rowed for gold in front of Adolf Hitler. Against the grim backdrop of the Great Depression, they reaffirmed the American notion that merit, in the end, outweighs birthright. They reminded the country of what can be done when everyone quite literally pulls together. And they provided hope that in the titanic struggle that lay just ahead, the ruthless might of the Nazis would not prevail over American grit, determination, and optimism. And even as it chronicles the boys’ collective achievement, The Boys in the Boat is also the heart warming story of one young man in particular. Cast aside by his family at an early age, abandoned and left to fend for himself, Joe Rantz rows not just for glory, but to regain his shattered self-regard, to dare again to trust in others, and to find his way back to a place he can call home.